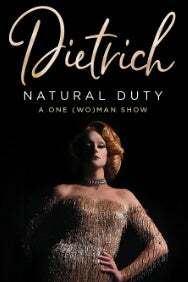 We do not curently have theatre tickets available for Dietrich: Natural Duty This could be because we have simply sold out or it could be that this show is no longer running. The information on this page remains purely for historical and informational purposes. An intoxicating one-(wo)man show revealing the life of a legend. This breathtaking mixture of theatre, cabaret and drag comes straight from the Edinburgh Festival and was a sold-out hit at VAULT Festival. It now transfers to Wilton’s Music Hall before New York, Amsterdam and Adelaide as part of a world tour.